Okay, so long time no post..what’s new. Along with all the normal stuff (kids back to school, work, etc), I have been working on re doing my kitchen island. Recently, I did a fluff on the kitchen with new cabinet paint, lighting, fridge and refinished hardwood floors. After living in this house for a year, we now realize that the island does not function well and is too small for our family. The dishwasher was on it’s last leg too. It was time to do something about it. 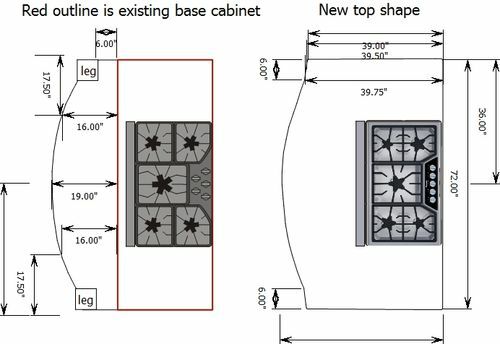 Purchasing a new Thermador cooktop and Bosch dishwasher and designing the new shape of the island came easy. The challenge was what countertop surface to put on the new island. I have Baltic Brown granite (we know how I feel about that) on black perimeter cabinets with a travertine back splash (snooze). I had the existing island painted peacock blue (not so snoozy). I had considered every countertop option…marble, slate, soapstone, granite, stainless steel, wood, quartz, you name it. I quickly ruled out wood, because of the cooktop and stainless just doesn’t work aesthetically. I really liked the idea of quartz but I could not find one that worked, so off to the stone yards I went. 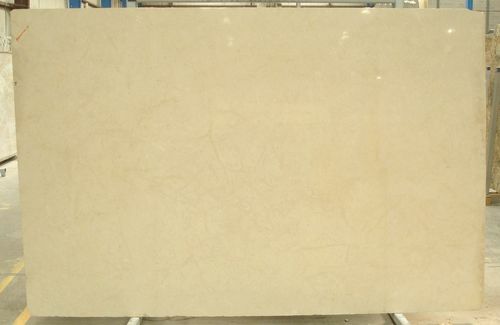 I almost pulled the trigger on a slab of Crema Cream marble, pictured here. It was so pretty, but my gut told me “no”. As I was leaving, yet another stone yard, the owner asked if I’d heard of leathered granite. 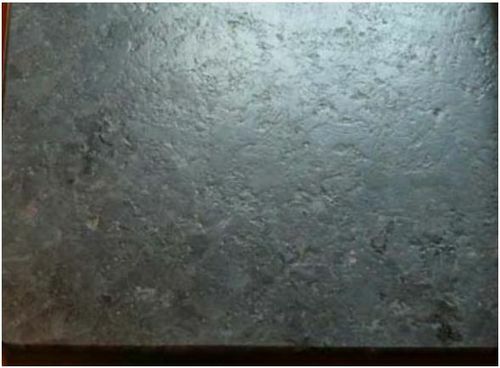 I was aware of honed granite but leathered granite was new to me. She then showed me some leathered Black Pearl granite and I knew right away, that was it. It was unique, cool and perfect. She also assured me that it doesn’t show finger prints and is very low maintenance. It is hard to tell from this picture, but it has a slight texture, with a matte finish. The Black Pearl has a slatey black background with some hints of taupey beige. Love the leathered granite! Can’t wait to see the transformation. I think that might be a granite even I can love – can’t wait to see the finished product. Better yet can’t wait to come see it for myself!! After more delays, they are finally installing the granite today. Kitchens are really exhausting.